Does your financial advisor act in your best interests or do they always seem to have something to sell? The first phase of the Department of Labor’s fiduciary rule went into effect on Friday. This is the rule that mandates that your financial advisor must act in your best interest. The whole thing doesn’t go live until 2018, but it will be interesting to see who makes what kinds of changes in the meantime. Some have rushed to comply. Others are banking on the Trump administration to overturn it. I was particularly interested to hear whether the local AM station’s annuity salesman would change up his schtick this weekend. He has an hour on Sundays to make his pitch in his non-threatening monotone. The focus is on potential returns of the annuity (really the change in income the annuity would pay – very different from change in total value). There’s always some sort of bonus and guarantee that you can’t lose money. What’s not in focus is fees and what your heirs would actually be left with after those fees and any income you would take. Unfortunately, this Sunday was like any other. The annuity guy didn’t change up his pitch and there was no mention of fiduciary duty. I’m disappointed, but not surprised. Be skeptical of anyone selling financial advice (the guy in the above example says he does “retirement planning”) based on a single product or product type. Cold callers used to pitch muni bonds in the 80s. IPOs and penny stocks were a favorite of boiler rooms in the 90s. High-pressure cold calling has largely fallen by the wayside thanks to the government’s Do Not Call list, but too many brokers still revolve their business around the investment product of the month. A common theme is income – high yield bonds, preferred stocks, closed end funds, MLPs. They put product first, planning second (if at all). 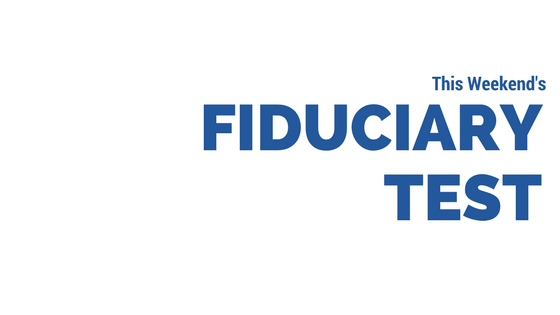 It is my hope that the fiduciary rule takes root. A plan built around the client using investments that are in that client’s best interests is the only acceptable means of financial planning.